Welcome to 2019, The Flash fans. I wish I could say the episode to start the new year is one of promise and indication of wonderful things to come, but... uh, well, let’s just assume they’re still getting their footing. It was a long hiatus! If I may use a holidays-specific metaphor, it’s like the show gorged on a lot of turkey and baked goods and now it’s gotta work off the lethargy of Christmas dinner before it gets back into the swing of things. 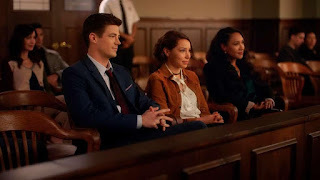 This week: Nora acts like a bratty teenager (again) and fails to understand that moral judgement can be varied on a case-by-case basis, Cisco and Caitlin have possibly discovered a metahuman cure and (inexplicably) Cisco would be okay with using it, and Barry is Sir Barely Appearing in This Episode. So, yeah — not the strongest midseason return the show has ever seen, but they can’t all be winners. Hopefully next week will be better. The episode starts in 2049, with Nora confronting an imprisoned Eobard Thawne about what she learned regarding his role in Barry’s mom’s murder. Thawne whispers his way through the conversation, swearing that he’s a changed man who only wants Nora’s help in proving such, but Nora ain’t picking up what he’s putting down. She returns to her past, our present, with a grudge against all lawbreakers in equal measure. This grudge comes into play when — and here’s a real rare moment, actually getting to see a villain of the week face trial — Barry, Iris, and Nora accompanying Cecile on her first trial back from maternity leave. The trial is for Joss Jackam, a.k.a. Weather Witch, and Cecile’s low-key psychic powers are picking up enough remorse from the defendant that she decides to go a little easier on her. Nora isn’t fond of this idea, so when Barry is taken out of commission and she replaces him as Cecile’s primary CSI witness, she practically orders the judge to put Joss before a firing squad immediately. According to Nora, criminals are irredeemable, soulless monsters who can never change, and all should be condemned forever, regardless of what they actually did. All law breaking is equal in her eyes. Murder? Rot in jail! Destruction of property? Rot in jail! Jaywalking? I hope you enjoyed that ill-timed stroll across the street because you won’t be strolling much as you rot in jail! Yeah, this is my major gripe for the episode, and since it provides the emotional through-line of the plot, my irritation is renewed quite frequently. The villain of the week, Silver Ghost, is a car thief looking to branch out into bigger and better things. She sets her sights on Joss as a potential partner in crime and uses meta-tech to take over the prison transport vehicle Joss is riding in after her trial. The sudden disappearance of Weather Witch en route only feeds into Nora’s vendetta of the week, reinforcing her assumption that every criminal Team Flash ever deals with will be equally bad as the guy who killed her grandmother. The thing is, Joss was kidnapped from the transport vehicle, not rescued, and she really does feel remorse over her actions as Weather Witch, and she takes the risk of luring Nora out in order to turn herself in. She hopes that Nora will back her up on the kidnapping thing so Joss’s crimes don’t look worse than they already are but, of course, Nora doesn’t. Which means the next time Silver Ghost stages a prison break for Joss, Joss goes willingly — if no one is going to believe she’s not a career criminal like her father, she figures she should just stop trying. Joss and Silver Ghost break into ARGUS to steal a fancy prototype car full of fancy tech. Fancy! It’s a real pity the user interface of the car looks on par with a cheap Facebook game. Anyway, Nora chases after the criminal duo and, having gotten a little pep talk on the value of second chances from Team Flash, realizes her mistakes. She tries a pep talk of her own, hoping to get through to Joss, but it looks like she’s too late — until she realizes that a life-saving burst of ice hadn’t come from Killer Frost, as she’d originally assumed, but from Joss’s weather staff. Unfortunately, Nora learns the worst possible lesson from all this and decides to go back to the future and hear Thawne out. Nora. Nora, darling, I am begging you to look up the word “nuance” in the dictionary. Caitlin performs some basic follow-up maintenance on the hand wounds Cisco got from Cicada’s dagger and he examines the shards she yanks from his palms, discovering that the dagger doesn’t just dampen dark matter abilities — it removes them completely. Cisco is inspired by this, explaining to Caitlin that the shards (or the dagger) could be the start of developing a permanent metahuman cure and undoing what the particle accelerator started all those years ago. They could actually stop their villains of the week on a more permanent basis without killing them. Cisco is thrilled; Caitlin is not. Side note: I’m way more on Cisco’s side than Caitlin’s regarding the use of a metahuman cure on villains. On the one hand, you have shoving metahuman after metahuman into special prisons for an indefinite period of time. On the other, you could remove their powers, put them into regular prisons, and allow them to serve time and be released like any normal criminal. The latter sounds a heck of a lot better than the former, if you ask me. What I’m not a fan of during this whole B-plot? Cisco’s sudden enthusiasm for normal life, which feels like it’s coming completely out of left field. Sure, they drop a couple lines about how Cisco thought being without powers was liberating and relaxing, but that doesn’t really gel with Cisco’s relationship with his meta-abilities up to this point. He’s always seemed proud about being Vibe, bordering on cocky; the show couldn’t have tried a little harder to lay some groundwork for this sudden change in perspective? By the end of the episode, Cisco and Caitlin agree to develop the cure with the caveat that it would only be used on willing participants. Okay, I guess... still think you guys should probably use it on criminals, but fine. Do whatever. Hey, I wonder if Cisco and Caitlin developing a cure for metas could mean solving the Cicada problem without any more bloodshe—oh. Nope. He’s going on a killing spree next episode. Cool. Cool, cool, cool. I still haven’t figured out what the deal with Sherloque is. Does he just get wrapped up in mysteries? Does he know more than we think he knows about Nora? He was suspicious of her from the start. Why? How? I usually enjoy episodes where Barry takes a backseat to all the action because they usually mean more room for all the other characters to grow and develop as independent entities, but this episode was really, really not that. Why is Thawne wearing a Wells face? And why can’t he speak at a normal volume?